THANKS TO ALL WHO ATTENDED “BEAUTY & THE BEAST” AT THE 2017 WINTER GARDEN MUSIC FEST THIS NOVEMBER! Pinocchio’s original musical string puppet production “Beauty & the Beast” was presented at the free and open-air Winter Garden Music Fest Saturday Nov. 11, 2017, along with many other great musical performances. Thanks to the City of Winter Garden and everyone who attended the show, as well as our old friends The Scroggs Family Puppeteers. The Winter Garden Music Fest is online at WinterGardenMusicFest.com. 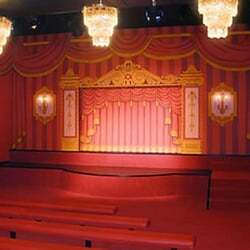 With its magical chandeliers and rose-red candy-box setting, Pinocchio’s Marionette Theater became the premiere permanent showcase for traditional string puppetry in Central Florida. Beginning as a touring company founded in 1999, the brick-and-mortar Pinocchio’s has given thousands of heartwarming performances (and hosted untold children’s birthday parties!) over more than a dozen years. Our 501c3 not-for-profit corporation continues touring locally and around the country a variety of puppet shows as well, notably Jane Henson’s “Nativity Story,” a moving Christmas piece with live sacred music and puppets built by the world-famous Jim Henson Creature Shop. To learn about our history and marionette musical presentations of Cinderella, The Wizard of OZ, The Little Mermaid, and many more classic fairy tale titles as well as venue requirements for booking touring shows, be sure to see our ABOUT PAGE. And to explore the possibility of booking a touring Pinocchio’s show for your party, venue, or event, write us through the CONTACT PAGE. As a not-for-profit charitable organization intended to make a positive cultural impact on our community, tax-deductible contributions may be made to us through the simple online credit card and PayPal DONATE button found on this site. The support is truly appreciated. We cannot do what we do… without YOU! Puppet Celebration, Inc., is a 501(c)3 Not-for-Profit Corporation, registration #CH15122.